India monsoon failure: Rainfall is far below normal in 2014. A man in Punjab on July 6, 2014, when the temperature was more than 100 degrees Fahrenheit. In large parts of India, the rains simply haven’t arrived this year. At the end of June—the first month of what’s normally a four-month rainy season—India’s monsoon was running a whopping 43 percent below normal. I’ve written previously that the Indian monsoon is the most important weather forecast in the world, and for good reason: Half the country’s 1.25 billion people are engaged in agriculture, and 70 percent of annual rains come between June and September. Irrigation is expanding, but most farmers still need the rains to have a successful harvest. There’s no larger group of people in the world more dependent on a single weather phenomenon. Now, amid a persistent and sweltering heat wave, the country still waits for rain nearly halfway through what’s normally the monsoon’s second month. A staggering 32 of the last 39 days have been warmer than normal in Delhi, with not a drop of rain falling during that time. This year’s Indian monsoon is well behind schedule. According to the India Meteorological Department, as of July 9, the rains are now a month behind schedule in some parts of the country. According to IMD statistics, all but two of India’s 36 administrative subdivisions have experienced below average rains so far this year, with one region—Gujarat—a whopping 92 percent below normal. 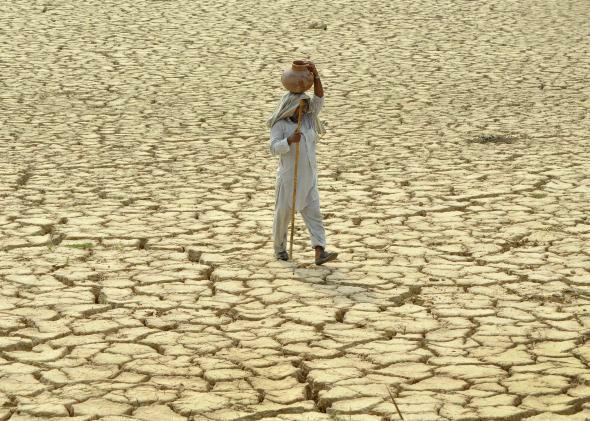 Only 9 percent of India’s land area is currently classified as having “normal” rains. In an update to its official seasonal forecast (PDF), the IMD now says the monsoon rains will be 93 percent of average this year, down from their initial 95 percent outlook. While those numbers may not look daunting at first glance, 93 percent of average would rank among the worst fifth of years since 1871. It also doesn’t reflect regional distribution of rainfall, which is often patchy in years with low monsoon rainfall. The IMD update cites “very high” chances of El Niño as a reason for the increased pessimism. (Earlier this year, the head of the IMD surreally accused Western weather forecasters of “spreading rumors” about a coming El Niño in an attempt to rig the Indian stock market.) Skymet, the leading private forecasting company in India, is much less hopeful, saying the odds of a failed monsoon, defined as less than 90 percent of average, have now risen to 60 percent. What are the chances that the monsoon rains could stage a resurgence and finish close to normal? Given what’s at stake, I decided to run the numbers. A few weeks ago, I cited recent research showing that the combination of El Niño (which is already taking hold in the Pacific) and a neutral Indian Ocean Dipole—an El Niño like pattern of periodic warming in the Indian Ocean—often leads to a failed monsoon. With a month’s worth of data in the books, it’s looking more and more like that could be happening this year. Given this (admittedly simple) analysis, there’s reason to believe this year’s monsoon now poses an 80 percent chance of failing. There’s a shred of hope: Thunderstorms have finally entered the forecast in Delhi. The bad news: they’re still a week away.